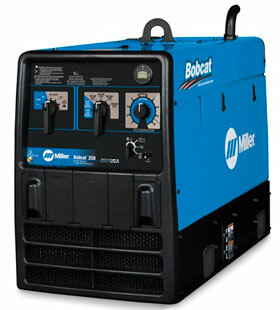 Rugged welder/generator is great for Stick and Flux-Cored welding and designed for maintenance/repair operations, construction, farm, ranch and generator use. Bobcat welder/generators take up less space on trucks and trailers—leaving more room on your truck for other equipment and tools. Plus, they’re easier to move safely around jobsites — even with weld cables and running gear attached. Quieter and Better Sound – Significant improvements in sound level and quality offer better jobsite communication, which provides a safer, more efficient working environment for you and your crew. 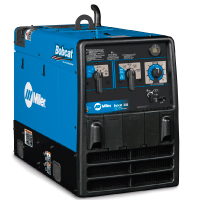 Smaller and Lighter Design – New Bobcat welder/generators take up less space on trucks and trailers—leaving more room on your truck for other equipment and tools. Reversed Generator Airflow – Exclusive engine and generator packaging design operates cooler and more efficiently. The engine is rotated towards the front to create more efficient airflow. Easier Maintenance – With its intuitive design, the daily maintenance of our new Bobcat welder/ generators is faster and easier. Industries Interests – Construction, DIY / Home Hobbyist, Farm and Ranch, Infrastructure, Manufacturing, Commercial Truck and Trailer, Maintenance and Repair – Field Operations, Mechanical Contracting, Work / Service Trucks.